Avnix Self-Dumping Bucket Forklift Attachment is ideal for anybody who needs to load loose materials like gravel, sand, rocks, trash and various other loose material and owns a forklift but doesn’t own a loader. 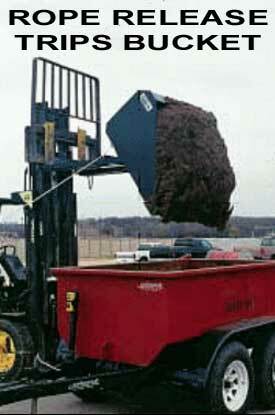 Our bucket forklift attachments are handy and it offers exact control of the discharge. Hydraulic flow from the forklift is necessary and hydraulic control valve is not included. Normally if the forklift is outfitted with a hydraulic fork positioner, flow from that valve can be diverted to the bucket attachment cylinder. The hydraulic cylinder provides a smooth controlled dump action. 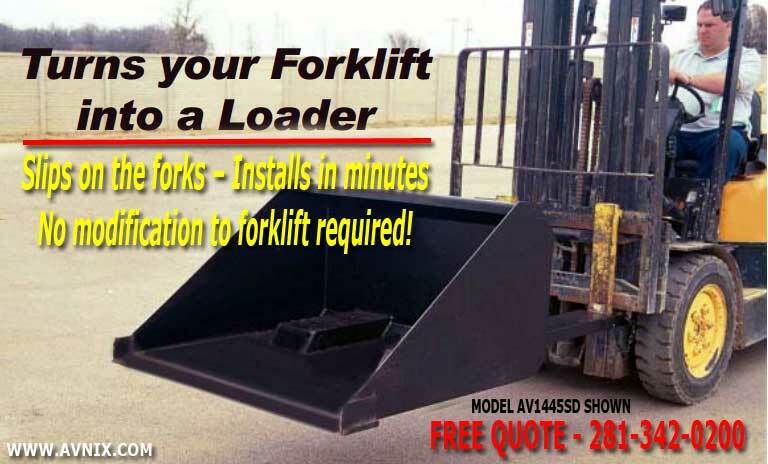 Easy installation on forklifts with side shift. – Simply install quick-disconnects in the hydraulic lines going to side shift cylinder. 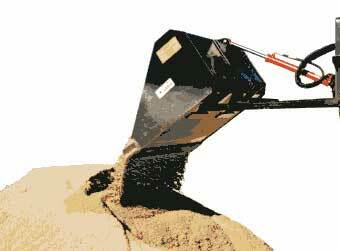 When bucket is used, hydraulic lines to side shift are disconnected and dump cylinder lines connected. Bucket dump attachment is then controlled with side shift valve. If not equipped with side shift, auxiliary hydraulics and valve are required. AV-1440SD ¼ yd3 45″ ID 420 lbs. AV-1445SD ½ yd3 45″ ID 525 lbs. AV-1472SD ¾ yd3 72″ ID 775 lbs. AV-1484DS 1 yd3 84″ ID 790 lbs. AV-1445SDH ½ yd3 45″ ID 600 lbs. AV-1472SDH ¾ yd3 72″ ID 760 lbs. AV-1484SDH 1 yd3 84″ ID 860 lbs.